GRAFENWOEHR, Germany — Some questions and confusion about recycling and trash pick-up linger at the Netzaberg housing community. Knowing where the recycling points are and how to properly sort materials is the first step to keeping Netzaberg beautiful. Some community members are disposing of their trash improperly and illegally at the recycle points in Netzaberg. Netzaberg community members can dispose of recyclables at any of three recycle bin points. Additionally, community members can dispose of refuse, paper, cardboard, plant-based biodegradable waste and yellow-bag materials curbside, based on the Netzaberg pick-up schedule. But some community members are disposing of their trash improperly and illegally at the recycle points in Netzaberg. 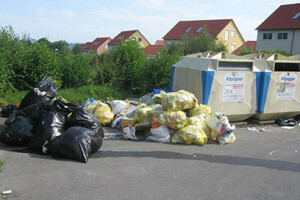 “This ongoing problem at the Netzaberg housing community is not only about common courtesy or aesthetics, it’s a violation of host nation law and Army regulation, forcing the garrison to unnecessarily utilize resources that could be used elsewhere, and may result in heavy fines of offenders,” said Helmut Bueller, the garrison’s separate or recycle trash coordinator. Improperly disposed trash and littered recycling collection points violate host nation law and Army regulation, possibly resulting in personal fines up to €500. The garrison trash and recycling page, www.bavaria.army.mil/trash, provides pamphlets, fliers and the trash pickup schedules. The SORT coordinator even monitors a Facebook page to assist community members. Netzaberg waste disposal: It’s not a garrison service, and this affects you. What makes the recycling point waste removal and curbside waste pick-up at Netzaberg unique is that it is not a garrison service. This means you’re subject to German rules, regulations and laws. The garrison pays the county for the waste disposal — both at the recycle points and your curbside — at government leased housing units in Netzaberg. German communities calculate the waste disposal fees by the capacity of the refuse containers. More or larger refuse containers result in higher costs. This means the U.S. Army foots the bill if you dispose of your waste incorrectly. Each housing unit is equipped with a black bin for refuse and a blue bin for paper. If you have extra paper, cartons, glass and cans, you can dispose of them at any of the three local recycling points in Netzaberg (see page 12 of link). “To make it easier on our community members, the garrison ensures that everyone at Netzaberg receives a 240-liter trash bin. The county calculates their use for up to 20 persons. That’s a huge benefit for Netzaberg residents since the county considers a 50- to 60-liter trash bin sufficient for a German household of up to five,” said Bueller. What’s true for German residents, is true for Netzaberg residents. If, for example, your refuse bin overflows and its lid does not close, the trash will not be picked up. The county considers it extra waste for disposal that is not paid for. If required, extra trash bags can be purchased at the city hall in Eschenbach. Cost is €2.60 per bag. This bag has print informing the garbage man that the service and disposal fee has been pre-paid. No print on the bag informs the garbage man not to take it. Cardboard boxes can be left with the paper bins for pick-up. The paper pick-up contractor can make money with it, so they get it all, said Bueller. What goes in the yellow bags for the curb in Netzaberg? Yellow bags are provided for packing materials consisting of aluminum, plastic and composite material, and are picked up at the curb on a monthly basis. Packing material include items such as plastics, vacuum packaging, cans, drink and milk cartons. For more details, see the trash separation table for the Netzaberg. Yellow bags are available at no charge at the USAG Bavaria Self Help locations on Tower Barracks, Bldg. 394, or on Rose Barracks, Bldg. 140. You can also pick them up at the city hall of Eschenbach, room 3, free of charge. Extra containers for cans are available at recycling areas, but aluminum cans may be recycled with packing material. There are 3 recycling collection points in Netzaberg. The recycle point at Roemersbuehl Strasse, pictured here, features containers for glass, paper and metal cans. There are three local recycling points in Netzaberg. For the convenience of the Netzaberg leased housing residents, three recycling collection points are provided by the county of Neustadt a.d. Walnaab. The recycling areas at Kappelenweg and Roemersbuehl Strasse feature containers for glass, paper and metal cans, the one at Henry-Kissinger-Strasse features containers for paper, glass, metal cans and yard waste. Recyclables are divided into paper and cardboard, glass and metal cans. Yellow bags and refuse should not be disposed at the recycling locations. 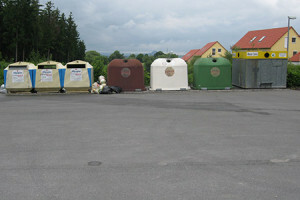 However, bulk trash, refuse and yellow bags can be found all over the three recycling stations in Netzaberg. Those violations are also reported by the German police patrolling the area, Bueller said. Improperly disposed trash doesn’t just disappear. Others are picking it up. For example, Tony Frazier, the garrison’s business manager, takes his “post police” out to Netzaberg to clean up. These include Soldiers who make up the garrison’s “borrowed military manpower,” or BMM. Other options to purge your stuff. Installation Management Command is the Army agency that provides services and oversight to all garrisons worldwide. 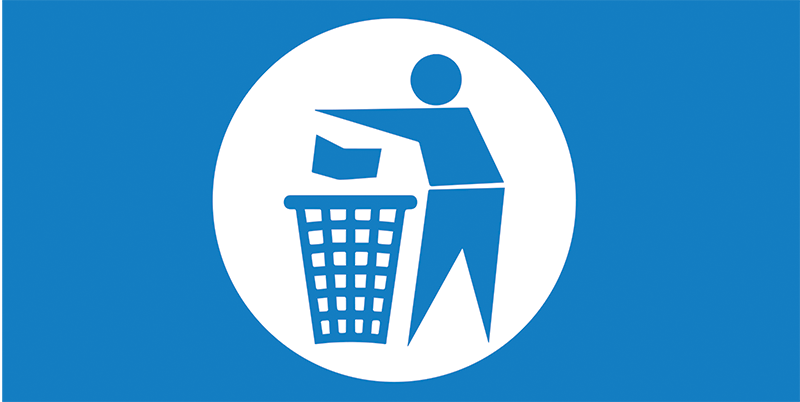 According to the IMCOM-Europe policy on waste disposal, community members living off-post are prohibited from dropping off their waste at collection points on-post, though there is an exception to this policy (see recycle center, Bldg. 700, below). This includes Netzaberg residents. But that shouldn’t discourage you from finding creative ways to dispose of or re-purpose your junk. Bulk Trash Pick-Up. The bulk trash pick-up schedule for Netzaberg is posted regularly on the garrison’s trash page. Netzaberg falls under the County of Neustadt. Bulk trash pick-up for Netzaberg is April 18, 2016. Recycle Center. You can drop off your bulk items at the recycle center on Tower Barracks, Bldg. 700, across from Range 118 on the community road between Tower and Rose Barracks. This is the garrison’s exception to the IMCOM policy on waste disposal. Freecycle & Thrift Shop. You can donate and deposit clean, useable items at any of the Freecycle Centers at Tower and Rose Barracks. The community and spouses’ clubs at Grafenwoehr, Vilseck, Hohenfels and Garmisch will also take your re-usable items. Do not drop off your garbage at the freecycle centers and thrift shops. HAZMAT. Hazardous waste such as batteries, oil, paint, antifreeze, cleaners and solvents should be taken to Self-Help. Bookoo.com. The website Bookoo.com is like a yard-sale, just online. Precautions for online safety and security should be followed here just like they would be on a Craigslist-type site in the states in order to avoid scams. The site also links you to buyers and sellers from surrounding bases such as Grafenwoehr, Ansbach, and Hohenfels. Facebook. There are several unofficial community “online flea markets” that can be a way to get rid of your stuff and make a few bucks. A few pages include Online Yardsale, Netzaberg Buying & Selling, Man Cave Exchange, Take my stuff and Take my kid’s stuff. “We know you want to do the right thing and keep your neighbor clean, safe and beautiful. We also ask for your assistance. If you see someone “improperly” disposing of their trash, please let them know they are doing it improperly. If you do not feel comfortable, please let your neighbor coordinator know,” Ridilla said. For more on recycling guides, trash pickup schedules or trash policies, go to the garrison’s trash and recycling webpage. You can also pick up all the SORT brochures and guides at the housing office on Tower Barracks, Bldg. 244, or the SORT office at Tower Barracks, Bldg. 329. If you have questions, call the SORT coordinator at DSN 475-6664, CIV 09641-83-6664.